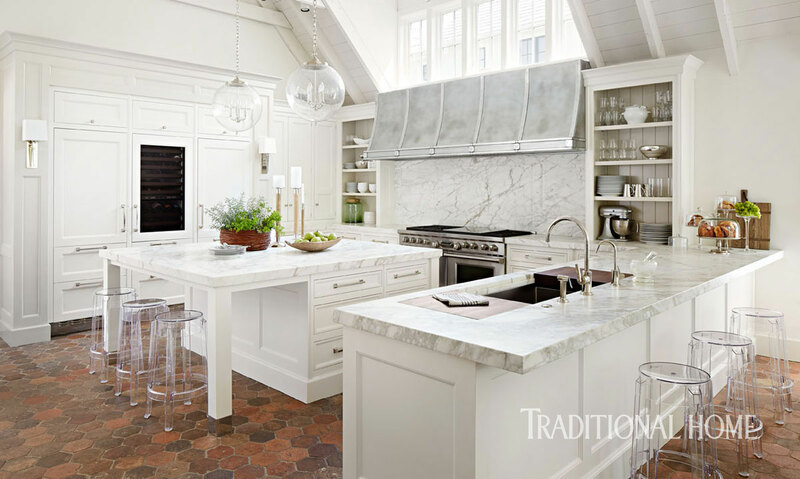 The latest issue of Traditional Home features a kitchen with antique French terra cotta floors. I'm kind of crazy for this floor, to say it mildly! I actually toyed with the idea of terra cotta floors in our San Francisco house. My idea was to tile the foyer and have it continue into the kitchen. Not quite sure why I abandoned this idea, especially after seeing this gorgeous kitchen in Trad Home. 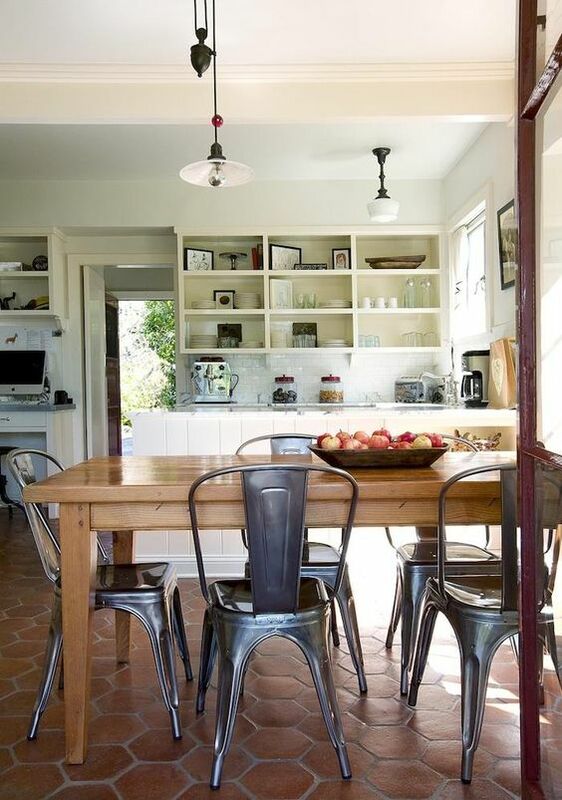 This floor in Elle Decor featured kitchen is another example of a crisp white kitchen, anchored by a terra cotta floor. 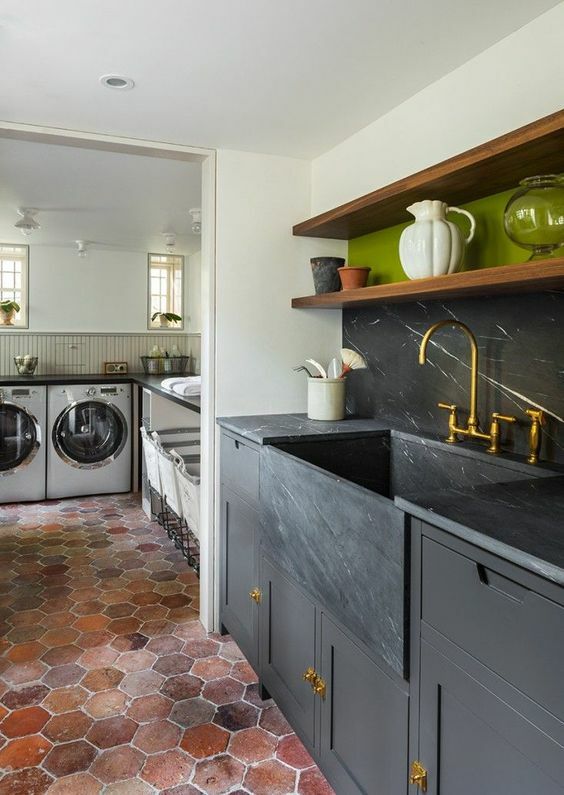 Although the Traditional Home and Elle Decor kitchens looks fabulous with all white cabinets and white marble, notice how the floor above looks with charcoal cabinets and soapstone counters in this laundry room, designed by Gerry Smith of Remodelista. Hexagon tiles are my favorite because the shape reminds me of honeycomb. 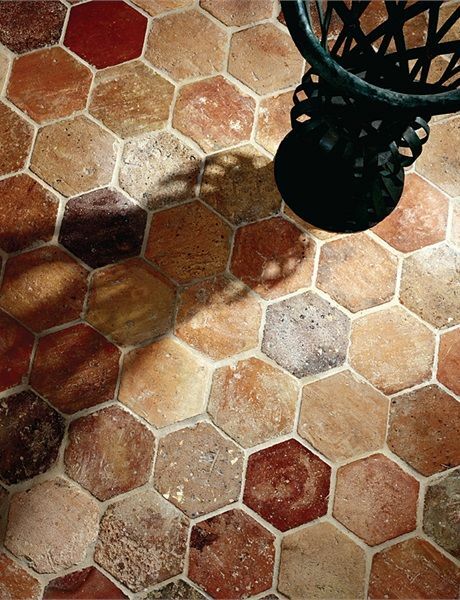 The variegated colors, along with the shape, gives the floor an old world feel. Antique French tiles are the best source in achieving that old world look, but there are knock-offs as well, being produced in Mexico. Years ago, I saw this home on a kitchen tour and I've never gotten it out of my head! Perhaps that's when I fell in love with terra cotta tile. The homeowner, Jamie Kidson preserved the integrity of the original kitchen using vintage tile as well as marble and white subway tile. I'm still smitten with this room. I absolutely love this kitchen, featured in Vogue. It looks like it's in a rural French farmhouse with its organic design and feel. 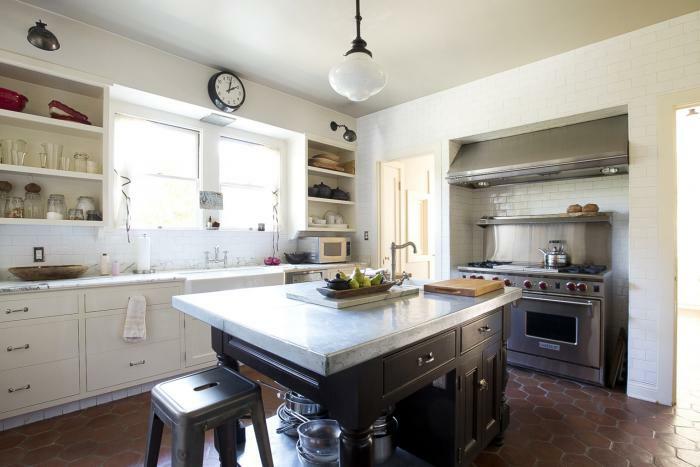 The random placement of rectangle tiles is easy on the eye and goes well with the rustic elements in the kitchen. I am saving this photo from Country Living to my "Asti Kitchen" pinterest board. I've been researching ideas and collecting inspiration for a future remodel. Terra cotta floors and black cabinets, soapstone and marble with white subway tile backsplash. 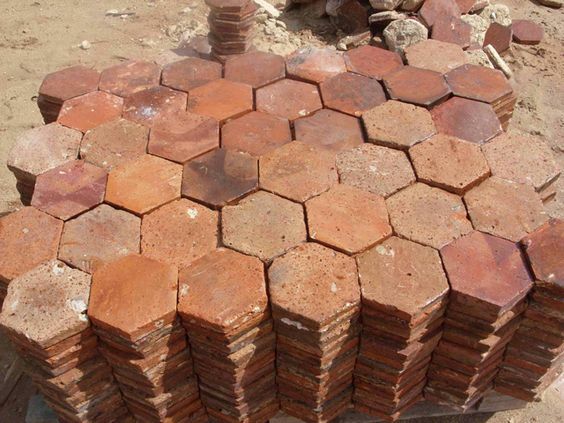 Whether I choose hexagon or random squares, the floor has to be terra cotta! Hi D! 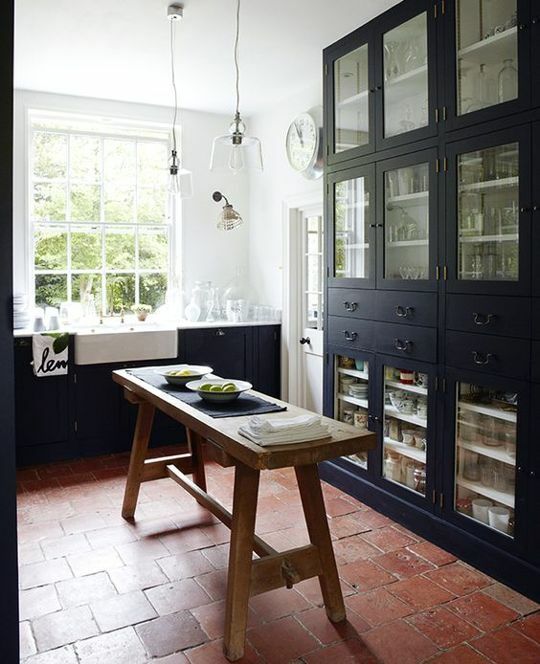 You know I am not a fan of oranges/russet, however I too love an older terracotta floor. I think it is the natural rustic feel and patina they bring to a room. It would be perfect for your Asti home. How exciting to be dong another design plan!! Keep us posted! I forgot to add, also love a beautiful brick floor, patio or walkway in an old used brick. Still feel very lucky to have that in our backyard. I have french imported terra cotta floors in my kitchen and I love them. Beautiful and also easy to keep clean. They go very well with my dark cabinets and marble counters. It is my favorite room in the house...and the one I spend the most time in. Ha! This looks exactly like our kitchen floors in our first house in 1977! Of course they were linoleum. Not the same at all. When we built our Palm Springs House we put in Italian terra cotta floors. I did regret it as I just do not like the orange at all. I love the french limestone. Our kitchen in Colorado has wood floors, Ivory cabs and soapstone with crystal knobs...love the wood. Everyone deserves a floor they love! All nice photos though. I wonder if one could get away with mixing the antique tiles with the knock-offs from mexico. It seems that the technique they use in Mexico today can't be THAT different from the techniques employed hundreds of years ago. It was all pretty low tech. Terracota floor was a must in Portugal in the 80's but it also have a lot of hard work in maintenance in the kitchen. They look nice but is not easy to keep it in good shape. Thinh twice before use it in vivid areas. We're researching a remodel for our kitchen, laundry room and hallway and am seriously considering terra cotta. We had it in another one of our homes and found it to be exceptionally low maintenance, especially if you have grandkids visiting or own dogs. My question is how to get a seamless look to an adjoining wood floor in the main living area; I'm silly for a classic, old world look and look forward to creating it in this home. Hi Delores, You might be on to something here. I agree - they're beautiful and timeless! There are so many different types of tiles it is hard to choose what the right tile is for your home. I absolutely adore this style of tile because it allows you to mix modern and country or rustic decor together, which is hard to achieve especially in a kitchen. Personally, I enjoy this tiling with darker color cabinets, I feel as though it brings a more modern design. omg. did you see Fixer Upper this week????? They had these tiles. OMG. TO die for!!!!!!!!!!!!! Our first house, a custom townhouse, small, in Ft. Worth - we had terra cotta - I made them lay them with extra wide and thick grout. I wish I still lived in that hosue! Saltillo tile floors have long been popular here in Texas. We didn't have the terra cotta floor in our previous home, but instead it was a gorgeous indigo blue in various shades. I miss that beautiful floor. We have Italian tile in our sun room here, and it is equally as pretty. It's a totally different look though. 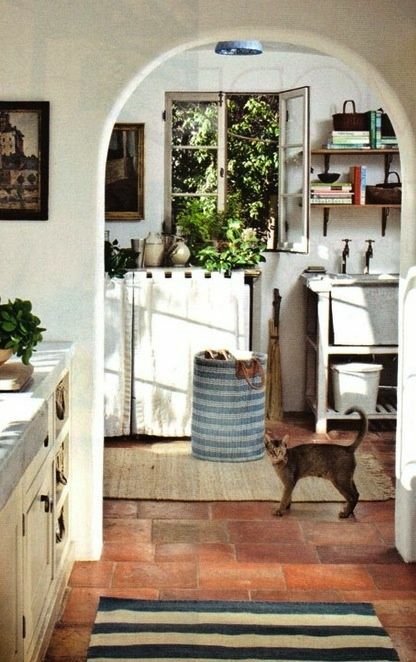 I love the idea of a terra cotta floor in the kitchen. Something to think about though is it is a hard surface for standing and working in a kitchen, like a brick floor would be. Our current home had brick floor in the kitchen, and we replaced it with wood flooring for that reason. Love the look of a brick floor too.